YA short story series: Tales of Ever Info and links here! One of my most favorite movies of all time. This is one of my favorite quotes too (next to “As you wish.” of course!) Yes, I'm an uber romantic. So, lets talk about Love since that is a big part of what romance is. Love is a funny thing. It's also such a general word. There are so many types of love, between friends, family, lovers, and so many levels of it. It can change over time. You fall in, you can also fall out. It can pull you in and spit you out. Love is everywhere in “real life”. It's part of what makes us who we are. Everyone has a desire to love and be loved. I think every book needs to have a little love in it somewhere. (Particularly books which take place over a period of time.) A story with NO love at all seems flat to me. It is a major part of how people interact, we love people, we search for love (and I'm not talking about this always being in a romantic way). Romance, even a little, even if it's hinted at, adds extra realism and spice to any story. In my debut novel Sweet Light, the main character Shara finds herself falling in love when she least expects it. (Isn't that always the way it is?) She is a healer, and that David is her patient doesn't help her confusion. She struggles between following her heart and doing what is expected of her. Just when things seem to going well she must face the arrival of her old lover. Finding she still has feelings for him tears her apart. On top of this, she discovers that her best friend, and David's cousin, is in love with her. When things go horribly wrong between her and David, she has to search her heart and decide on who she truly loves and who she will choose. Love is never perfect, or easy. It can be cruel and threaten to break you. Sometimes you have to make a choice. When those choices are hard, you can only hope you make the right one and deal with any consequences. Though a fantasy, set in another world, Sweet Light is also full of romance. I hope readers will enjoy following the strings of love which wind around Shara and cheer for their favorite hero. Love can be irrational. It can make you do crazy things. Trying to hold on to love, you may do things you never imagined you would. Jennifer Wylie was born and raised in Ontario, Canada. In a cosmic twist of fate she dislikes the snow and cold. Thanks to her mother she acquired a love of books at an early age and began writing in public school. She constantly has stories floating around in her head, and finds it amazing most people don’t. Jennifer writes various forms of fantasy, both novels and short stories. 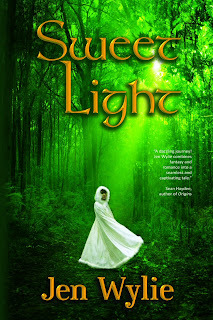 Sweet light is her debut novel to be published in 2011. She currently has a number of short stories published as ebooks thru Echelon Press and available at Amazon, Barnes and Noble, Smashwords and OmniLit. Jennifer resides in rural Ontario, Canada with her two boys, Australian shepherd a flock of birds and a disagreeable amount of wildlife. I love the cover art design for novel and Princess Bride is an annual event for me. Andre the Giant was lovely in it. Good post, Jen. I've noticed that our fantasy novels at Hadley Rille, and many of our science fiction novels, as well as archaeology stories deal with love one way or another. It's part of life and to leave it out would be cutting that part of reality from the story. Guess we're doing something right. Something we'll be continuing on into 2012, eh? It's been great fun having another author on my blog...this might be the start of a whole new dimension to my blogging experience! Thanks Tammy! I love my Sweet Light cover too! Thanks for hosting Jen, Angie. There are some good points made about the ubiquity of love, and they are challenging for me as a new writer as I am still wrestling with it as one theme in a short story I'm working on. 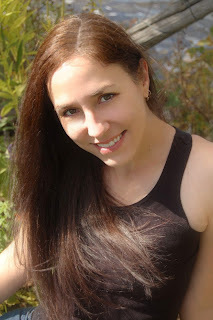 Writing a believable love story is possibly one of writing's greater challenges. I hope I learn to do the subject justice as you have. I agree with you Jennifer, a story with no love at all seems flat to me. I can't help it, a murder-mystery, a sci-fi, a piece of dark fiction, etc, I'm always looking ahead to see if the MC is going to hook up with one of the other characters or some mysterious newcomer! LOL! I'm a sucker for love and I'd eat fried worms for it. Ah, okay, maybe not fried worms, but you get the idea! Thanks for guest blogging. Nice to meet you! I agree with romance in books. It definitely adds a wonderful subplot or can even be the main plot. I'm also not a huge fan of the cold. Wonderful sharing interview. Great interview! Every story needs a little bit of love - it gives us something to cheer for, to live for, to strive for. Seriously Cute Blogger Award? Seriously?